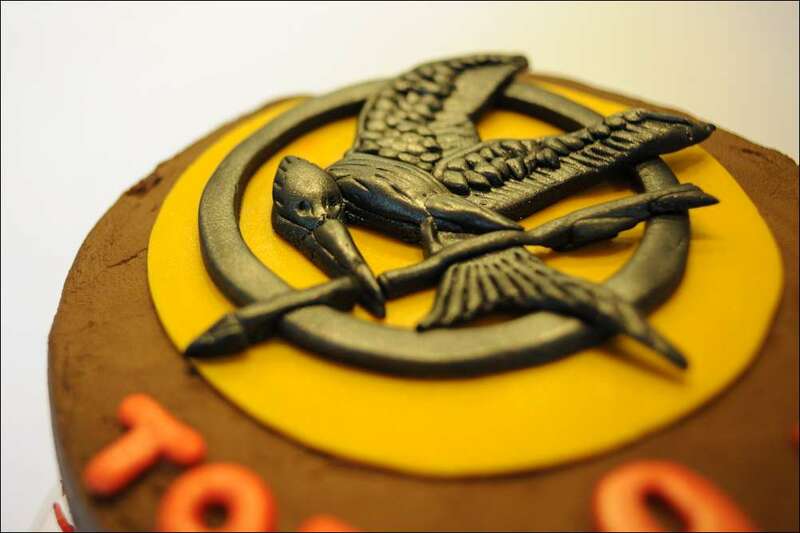 Hunger Games “Mocking Jay” Birthday Cake! 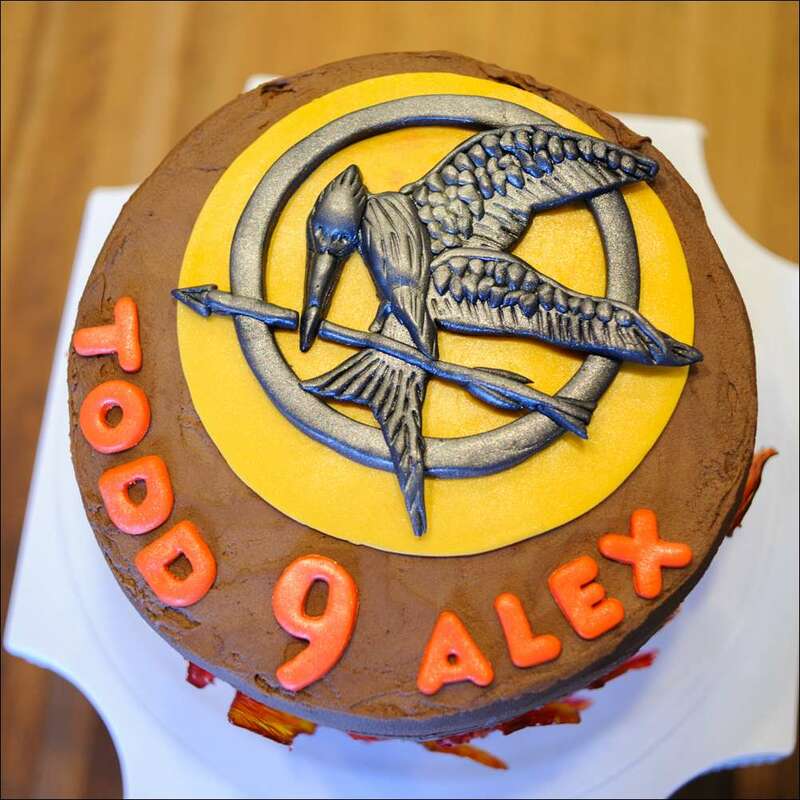 I was called into action once again this year to make a cake based on pop culture for my middle son’s birthday. 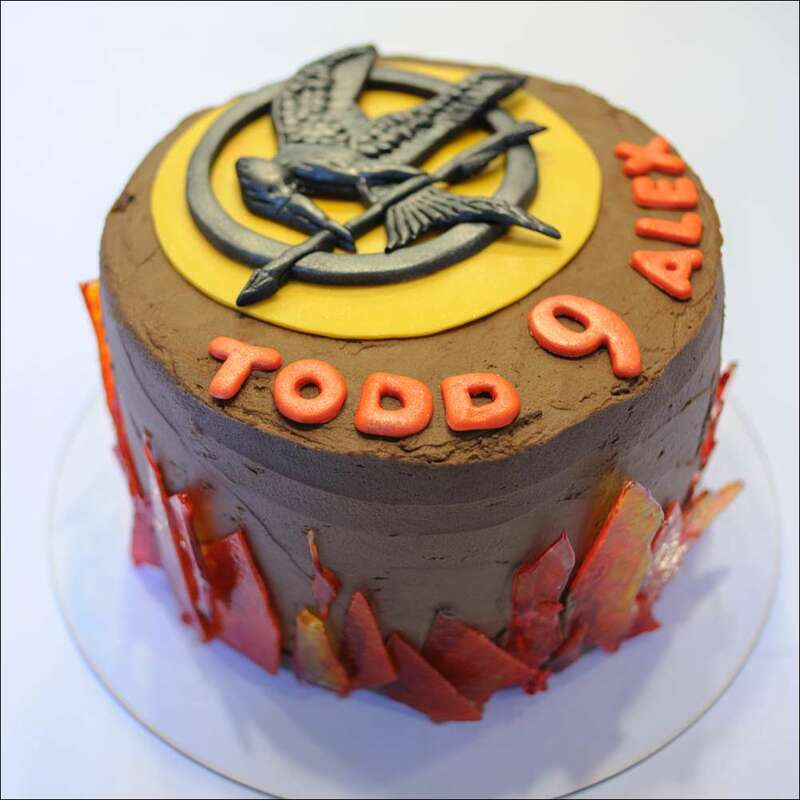 Last year it was Minecraft (see previous and varied posts); this year he wanted a “Hunger Games” birthday. 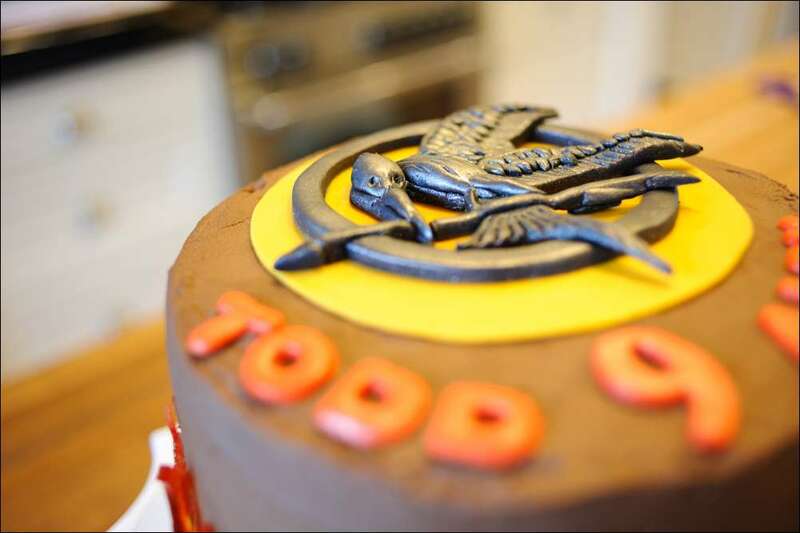 Actually, when describing what he had planned with the other 7 crazy 3rd-grade boys he’d invited for a sleepover (My son: “…we want to have a bunch of random stuff thrown in a bag with some Nerf weapons, run around the yard and hide from each other, make alliances when we can, and look for ways to survive while getting the other guys out….”; Me: “Hmmm, that sounds a lot like the Hunger Games…”). 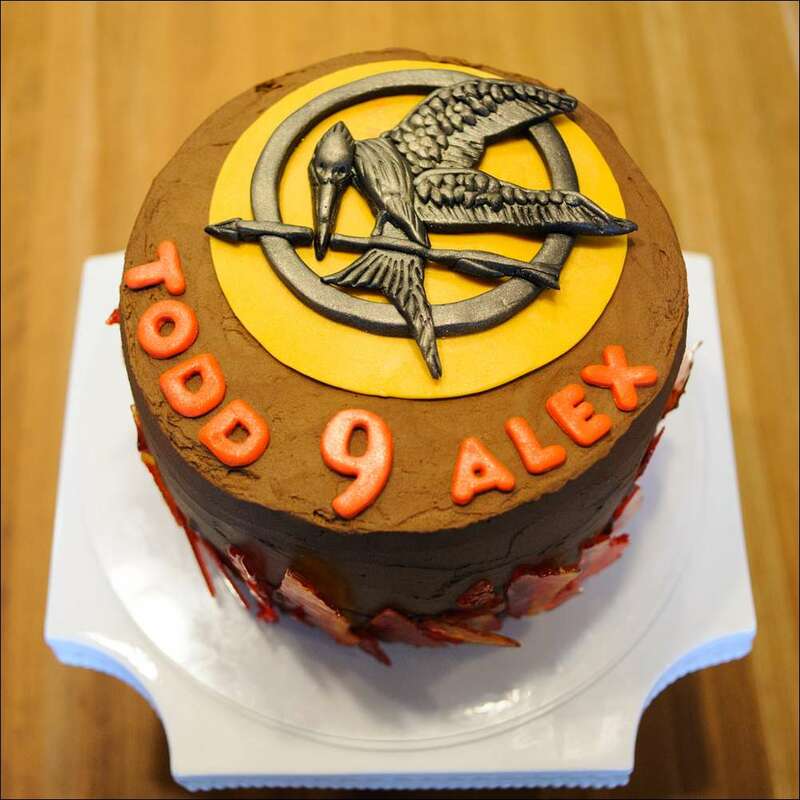 Thus, the theme for his 9th birthday was born! 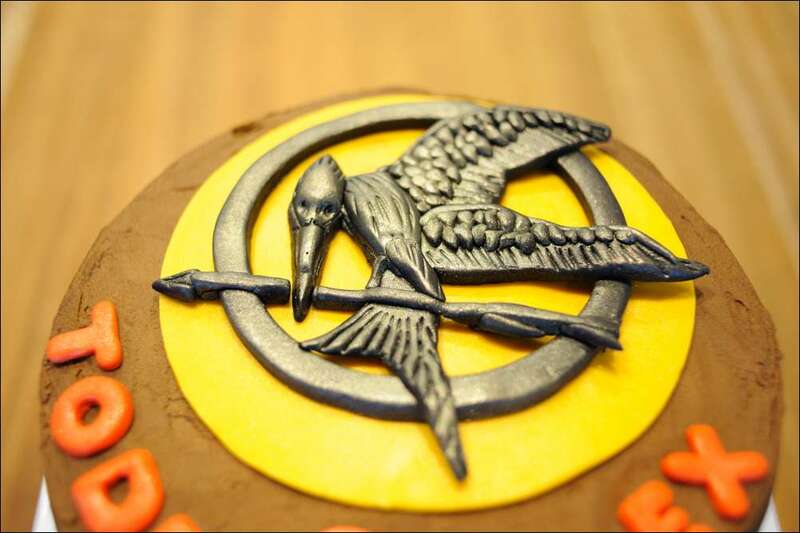 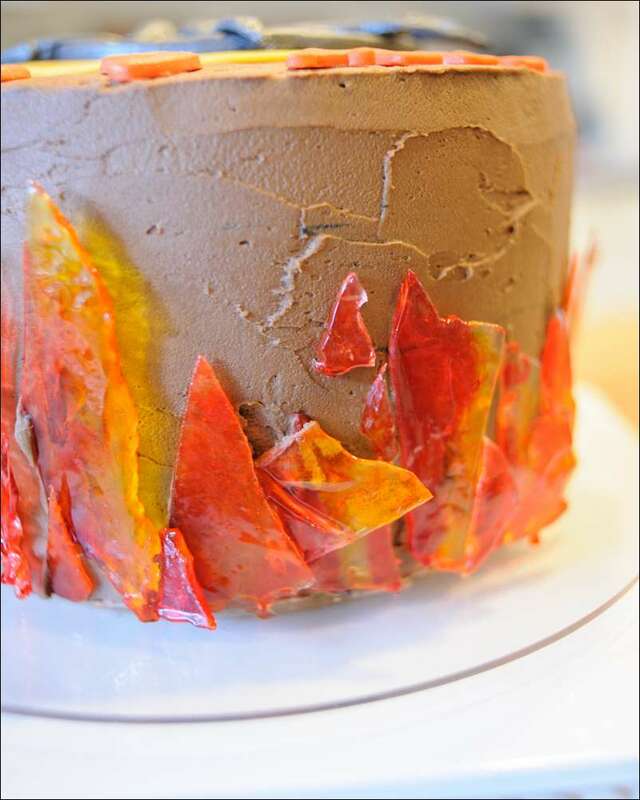 After searching on line for a simple cake idea (we didn’t need anything too big), I came across another terrific tutorial by Ann Reardon of “How to Cook That” illustrating how to make the fondant Mocking Jay pin for the top of the cake as well as the sugar flames. 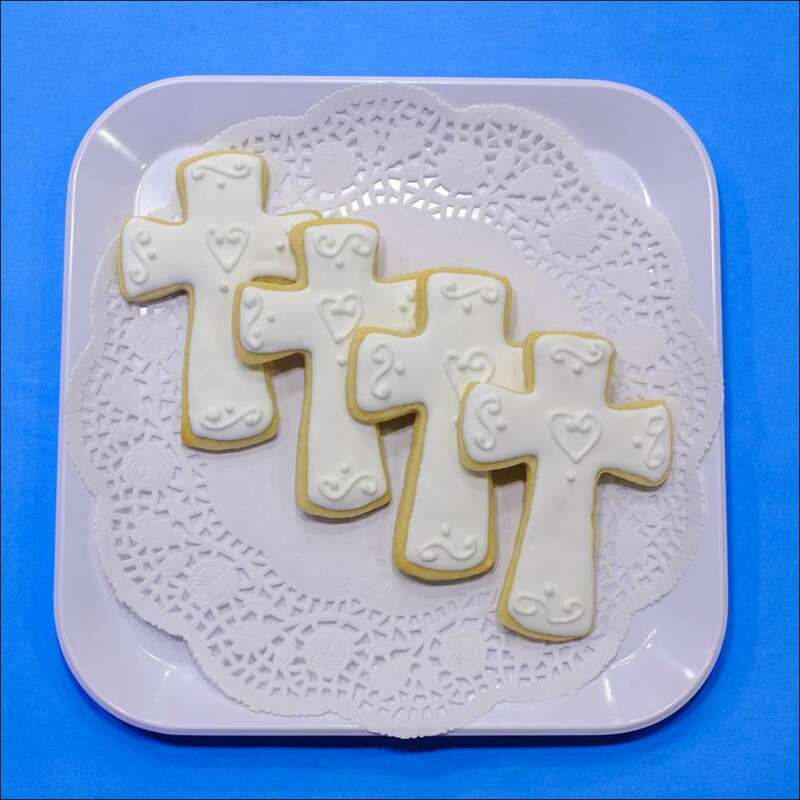 She really does some amazing stuff, all while making it look so simple…check it out if you haven’t already. 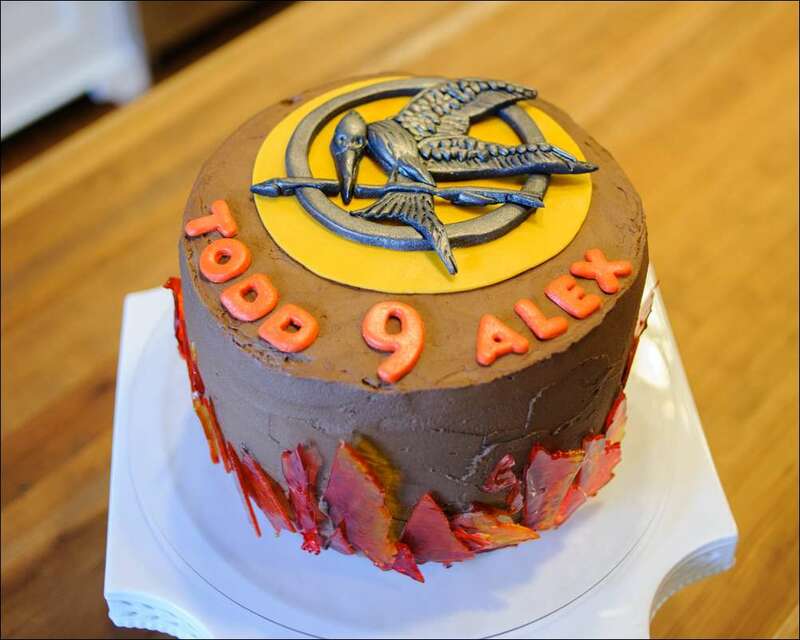 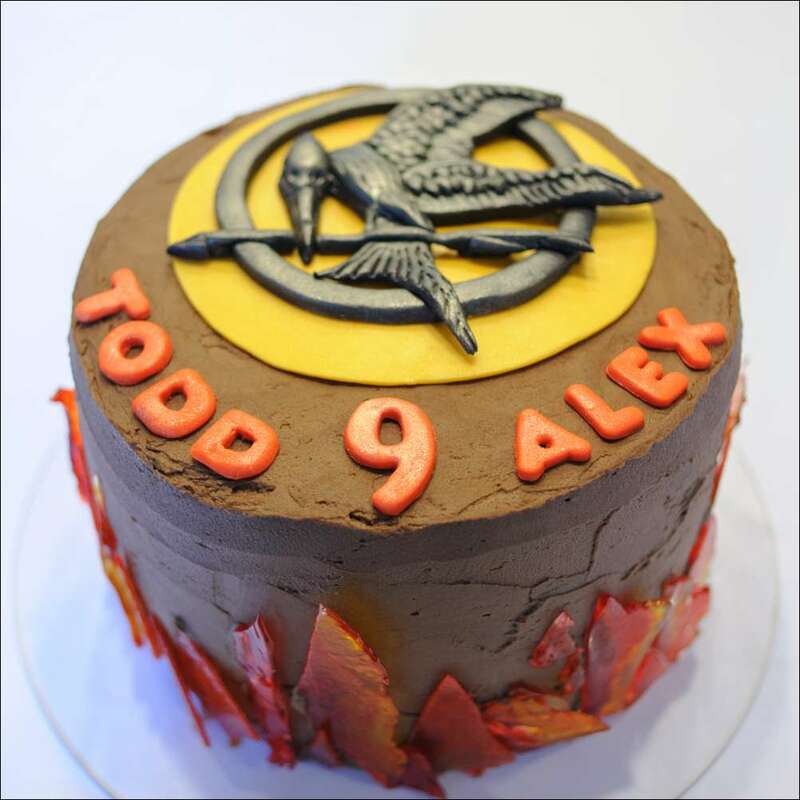 The Mocking Jay pin, yellow circle, and the letters for the names are all made from homemade marshmallow fondant (it was a combined birthday party with my son and his friend who was also turning 9). 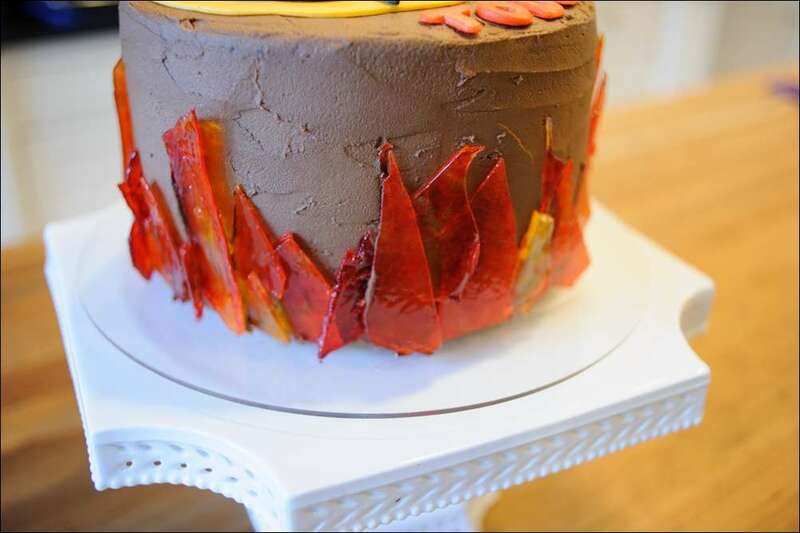 The “flames” are made from homemade sugar candy colored yellow and red. 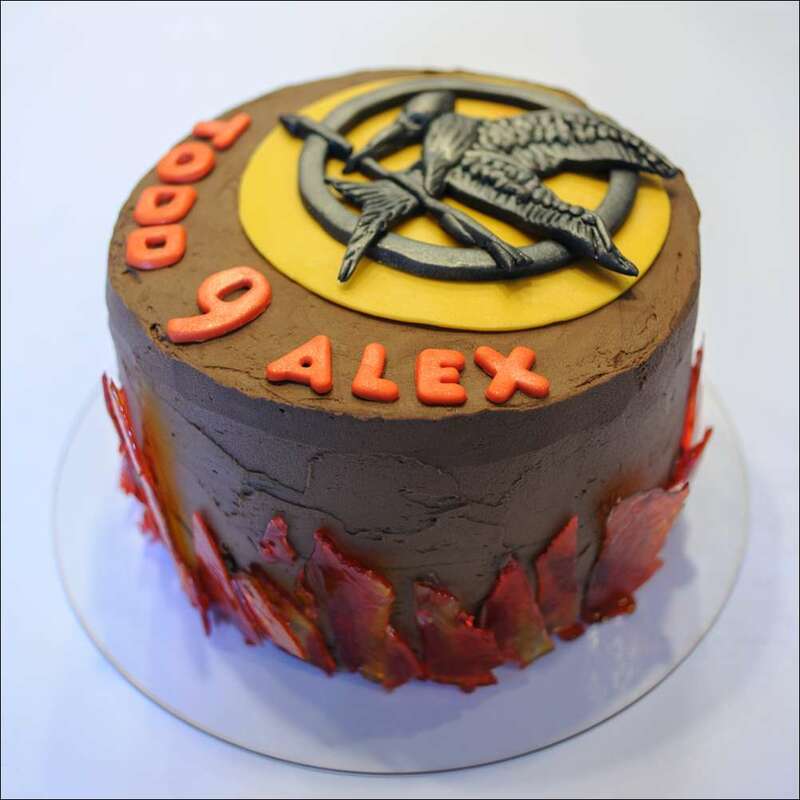 The cake is a 3-layer (chocolate and vanilla) 8-inch round filled with cookie dough filling and covered in chocolate buttercream. 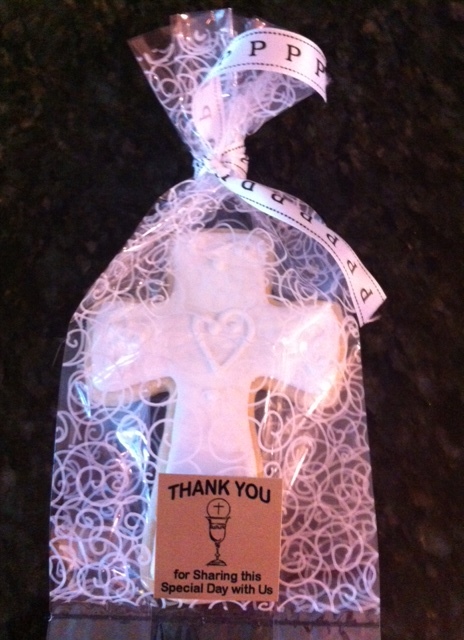 The boys thought it was great and my husband and I survived to live another day!! 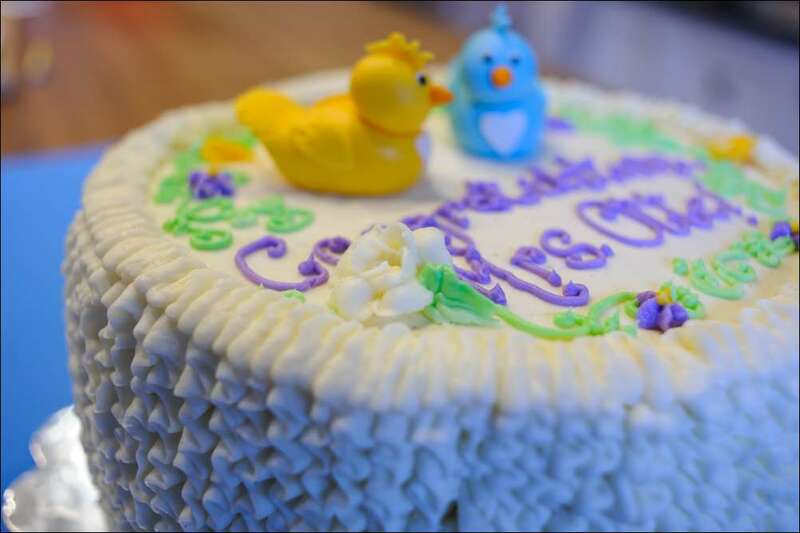 I guess the odds WERE in our favor this year! 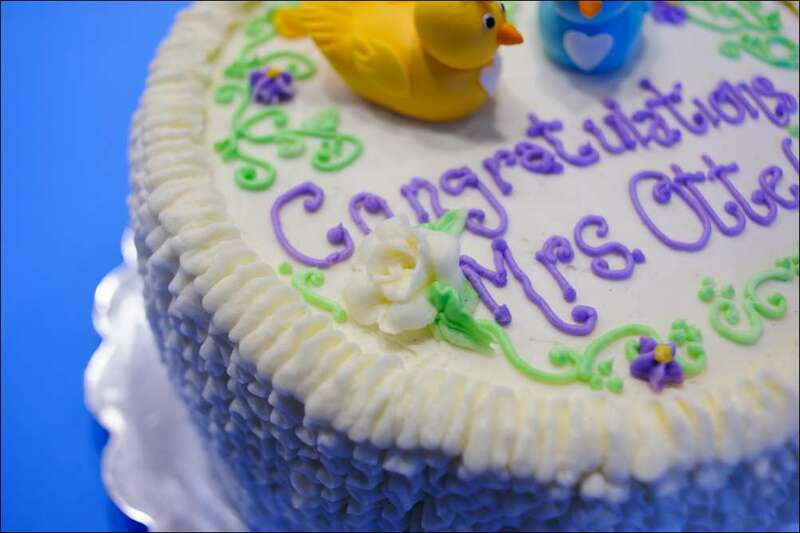 I recently made this cake for a lovely friend in celebration of her marriage…and her new name! 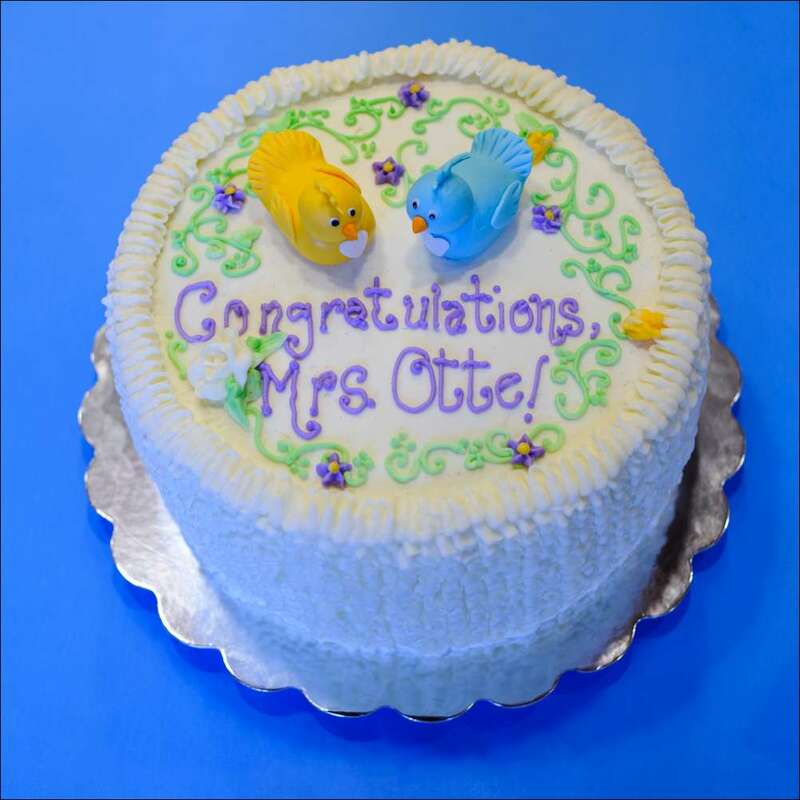 Her wedding theme was love birds, so I made these out of homemade marshmallow fondant and decorated the top with flowers and vines. 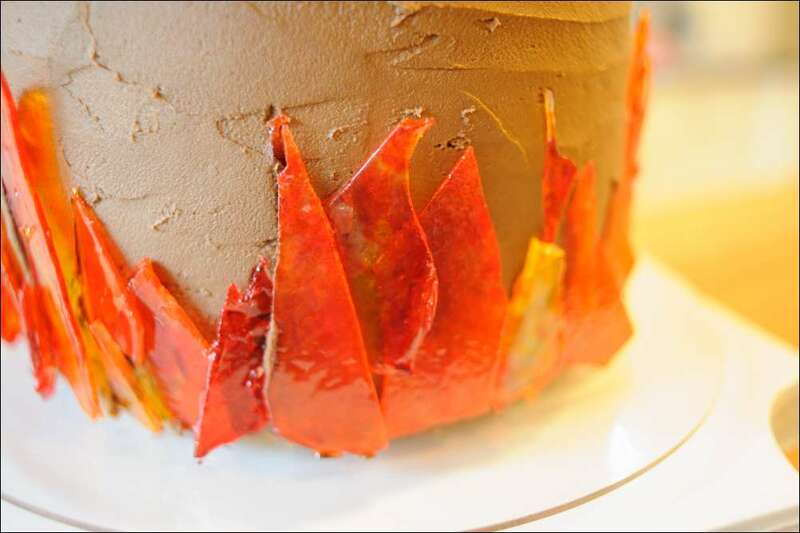 The 10-inch cake is 4-layers of double-chocolate and sour cream almond with cream cheese icing between the layers.The sides are done in vertical buttercream ruffles using a leaf tip, which kind of gives the cake the look of a cozy little nest. 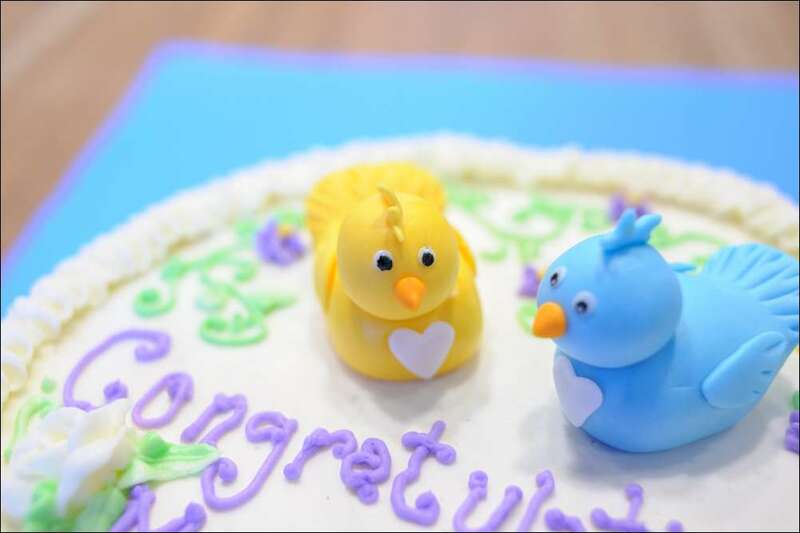 Congratulations, Linda! 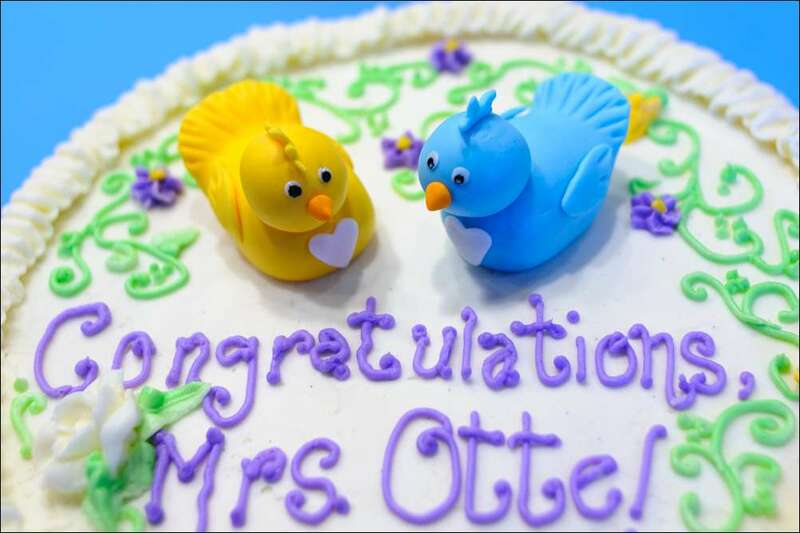 May you enjoy many happy years with your new love bird! 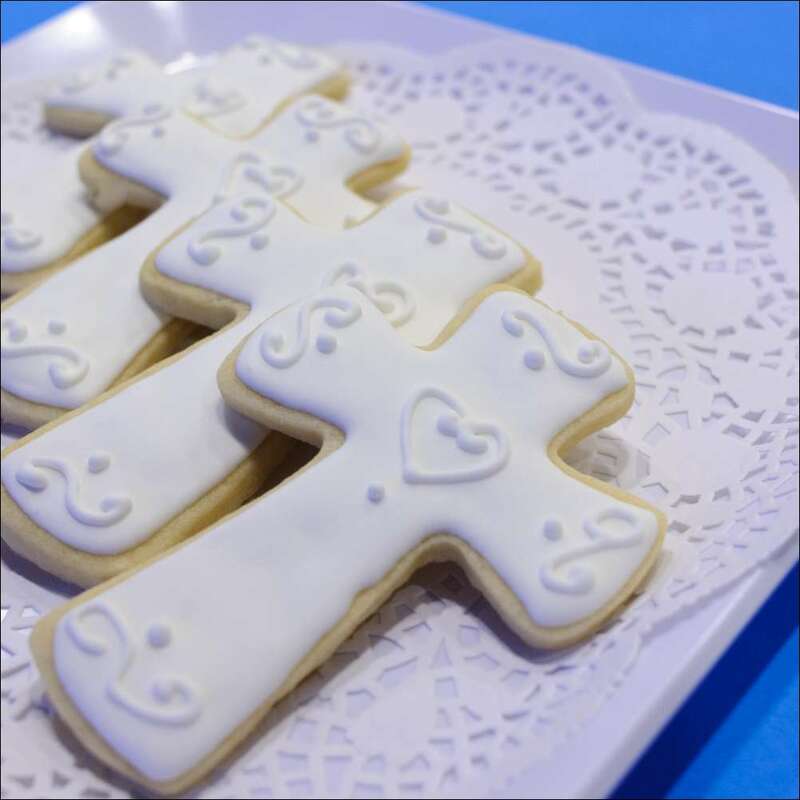 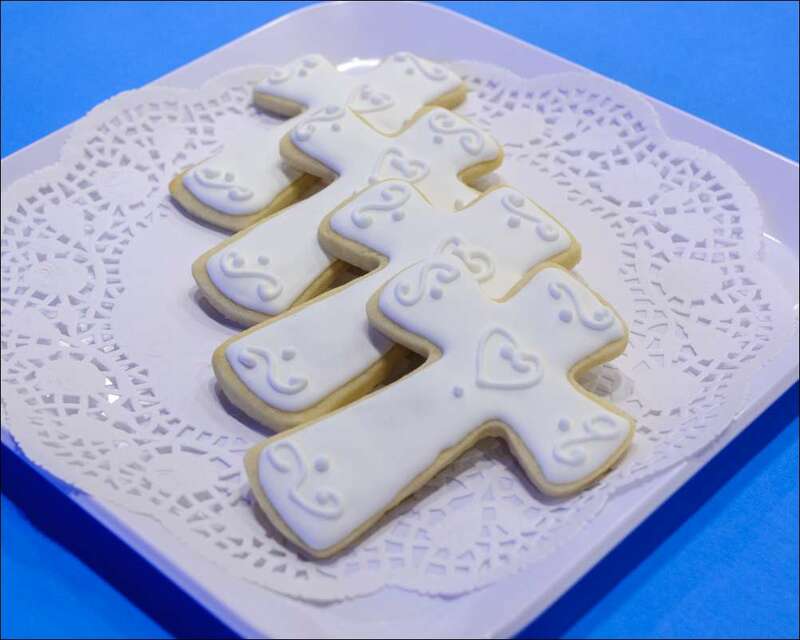 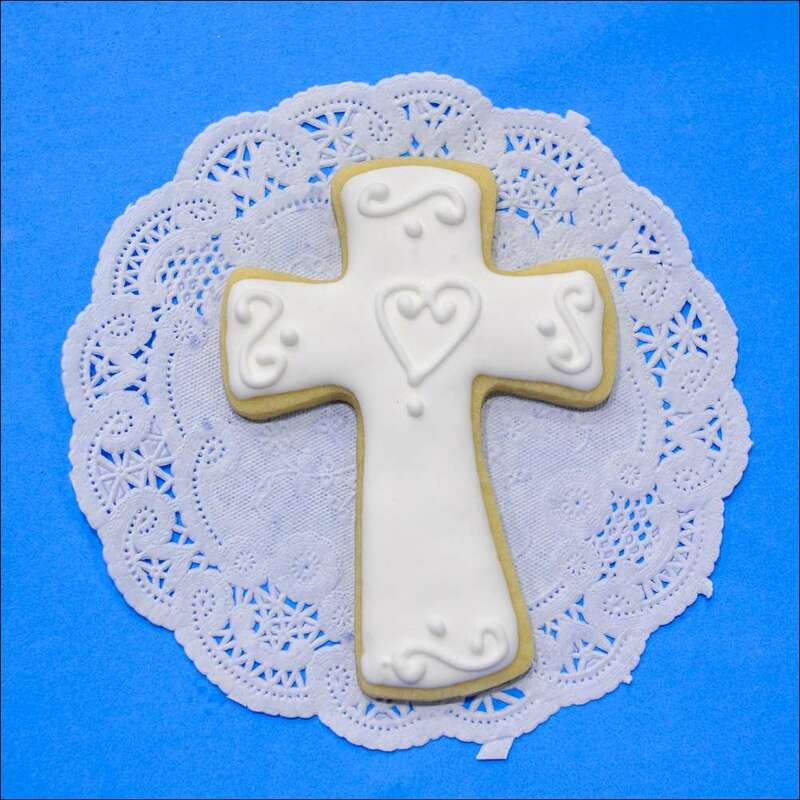 These cross-shaped sugar cookies are frosted and decorated with lemon royal icing. 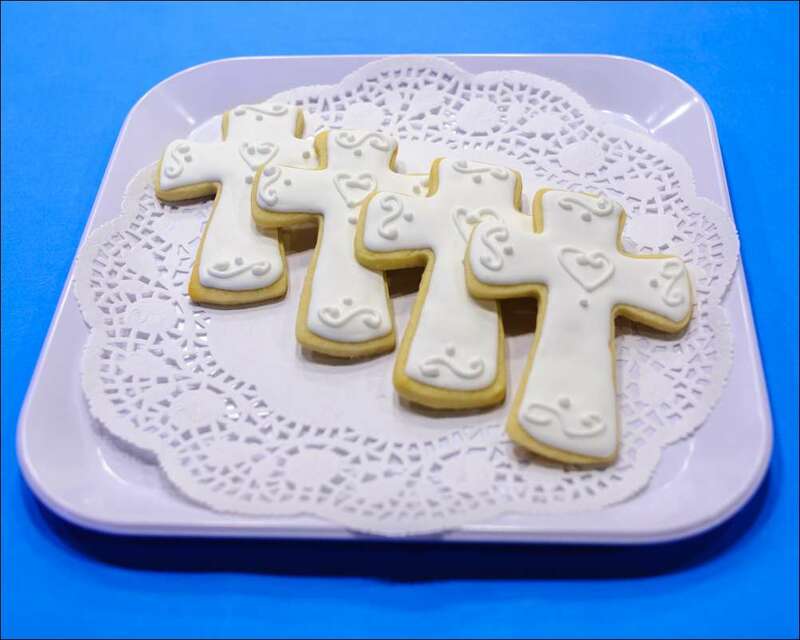 My friend asked that I make them as favors for her son’s first communion party. 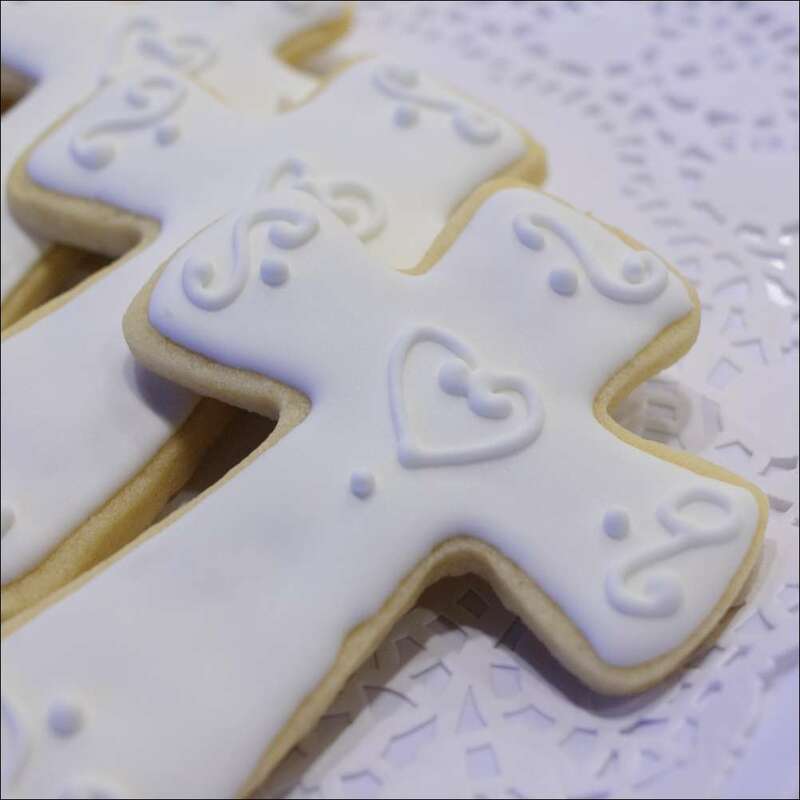 She bagged them in lovely little bags with a plaque thanking friends and family for sharing the special day with them….Very classy! 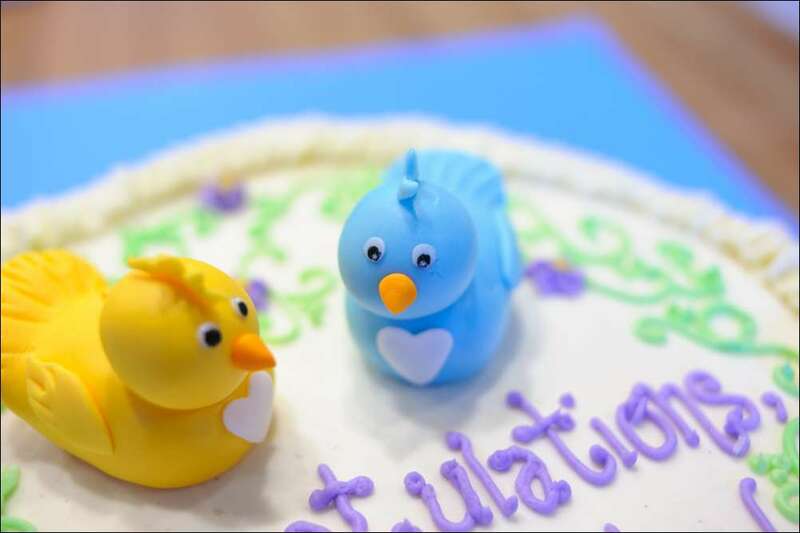 It’s been a busy couple of months for me with kids, sports, school winding down, etc. 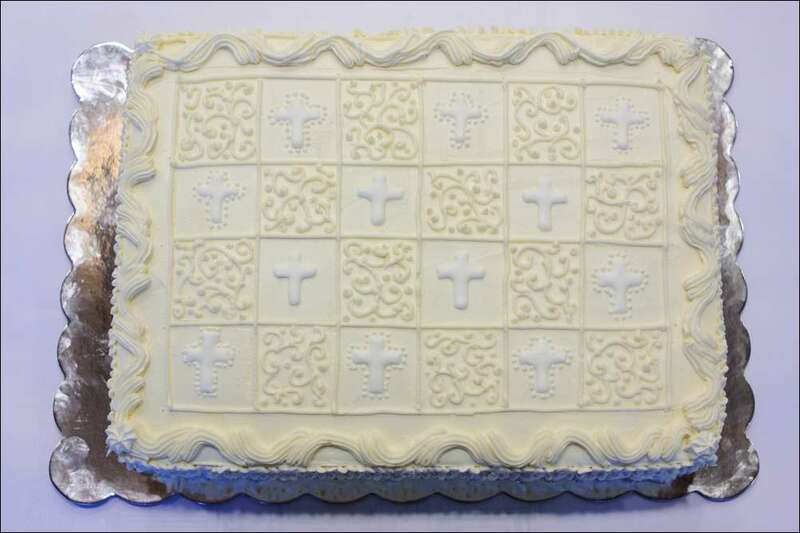 I did get to make a first communion cake for my good friend, Kerry, who’s son was making his first communion this Spring. 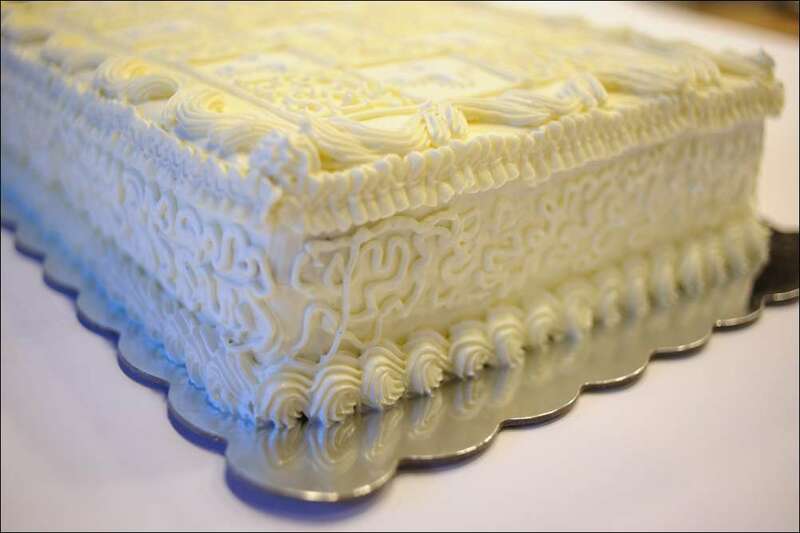 He asked for a chocolate and vanilla layer cake with chocolate buttercream filling. 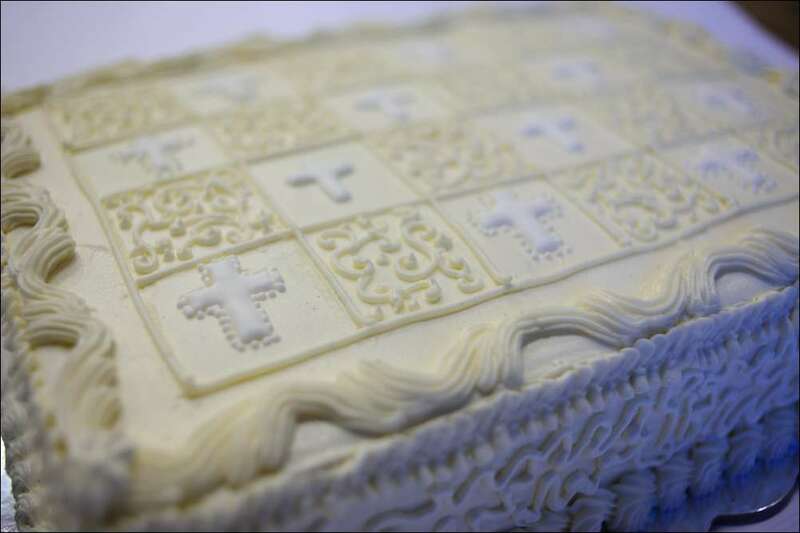 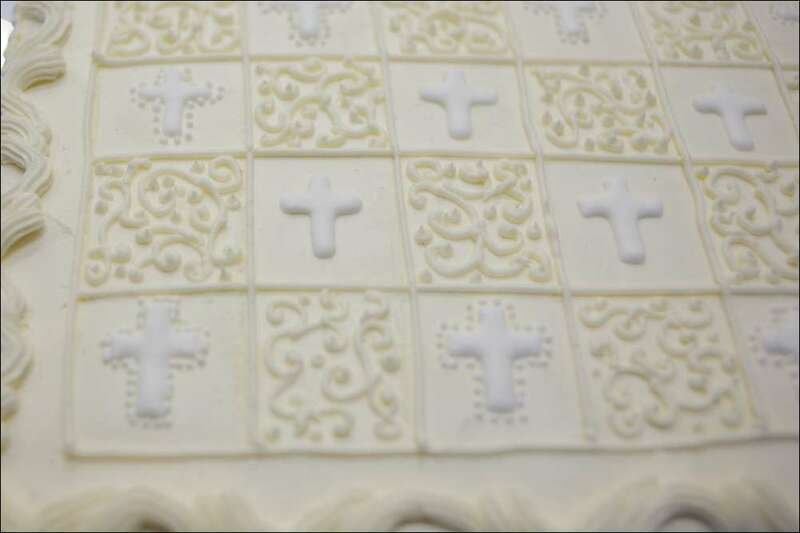 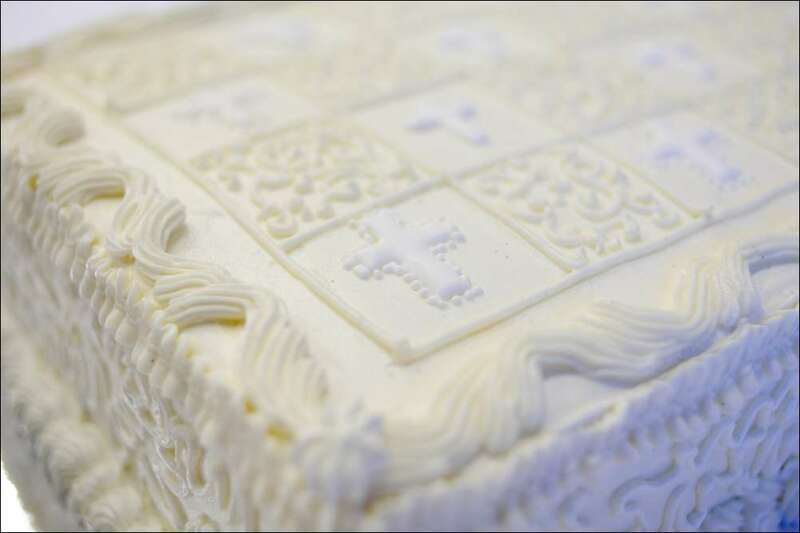 The outside is frosted with vanilla-bean Swiss meringue buttercream and decorated with little royal icing crosses I piped onto parchment paper and let dry overnight. 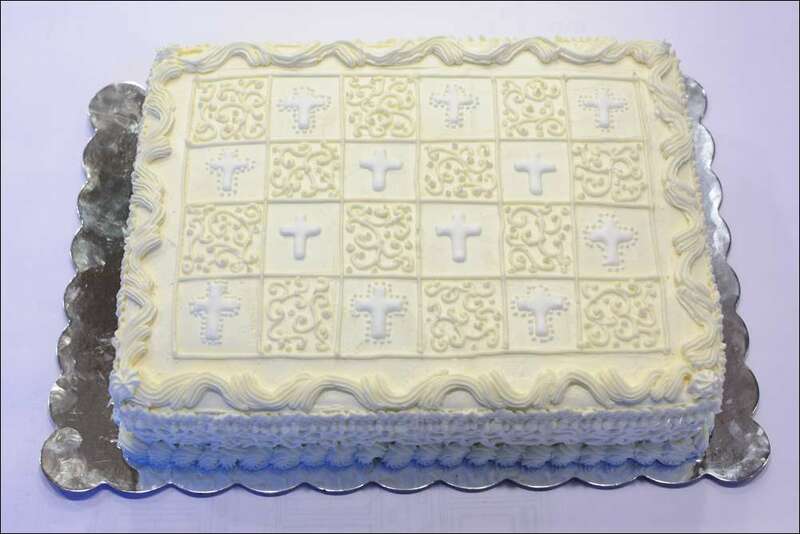 The color theme was white-on-white and favors were cross-shaped sugar cookies (see the next post) put in bags decorated with swirls and curlycues, so I carried that theme over to the cake. 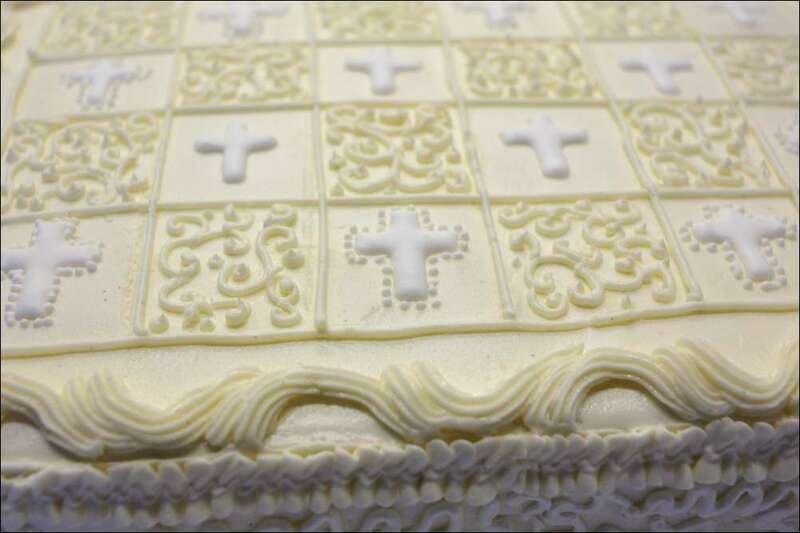 It was a fun one to make and such an honor to do it….Congrats on your Holy First Communion, Nicholas!